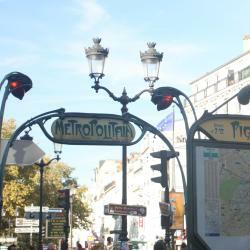 Looking for hotels near Parc de la Villette? Featuring free WiFi, B&B Hôtel Paris Porte de la Villette is located in the 19th district of Paris, 0.9 mi from City of Science and Industry and the Philarmonie de Paris. The staff was awesome, so friendly and helpful. Located in Le Pré-Saint-Gervais, just 1.2 mi from Buttes Chaumont Park, Hôtel Rachel offers a garden and luggage storage. Cutest French place, with a very nicely decorated room. It was the perfect size. The ibis Paris Pantin Eglise is 66 feet from Église de Pantin Metro station. It offers air-conditioned rooms, free WiFi throughout, and safety deposit boxes are available at the reception. The stuffs were really nice. They were super friendly and willing to help us. Located in the center of Paris, 82 feet from the Bolivar Metro Station and a 5-minute walk from the Park Buttes Chaumont, Relais Bergson offers soundproofed rooms with free WiFi. Very near from Metro, supermarkets, and very good park just 5 min. Hotels with great access to Parc de la Villette! Just a 3-minute drive from the Boulevard Péripherique, this 3-star hotel offers a 24-hour reception with free computer and internet access. The staff were very friendly and helpful. The ibis Styles Paris Crimée La Villette is located in Paris, a 15-minute walk from Parc de la Villette and 1.3 mi from Les Docks de Paris Event Venue. The room although small was perfectly built and clean.